Palm trees stand outside of the Hilton Los Angeles Airport hotel in Los Angeles, Oct. 25, 2015. At least 20 unionized Los Angeles-area hotels will see their labor contracts expire Nov. 30, according to Bloomberg Law data. Marriott, InterContinental, and Hilton are among the hotel chains whose worker contracts are set to expire in the final weeks of an already record-setting year of hospitality industry work stoppages. Prominent hotels like the Beverly Wilshire Four Seasons and the Beverly Hilton hotel are among those whose worker contracts expire Nov. 30. The contract expirations in LA follow nationwide Marriott strikes spearheaded by the union UNITE HERE, with one strike still lingering in San Francisco out of the eight original regions that saw work stoppages. In total, more than 20 work stoppages have been initiated in 2018, the most on record for decades, Bloomberg Law data shows. The only year that comes close is 2010, when nine work stoppages took place. UNITE HERE has sponsored 17 of the 20 strikes this year. In LA, no strike action is planned yet, but a tentative vote to authorize a strike is scheduled for Dec. 6, UNITE HERE local 11 spokeswoman Rachel Sulkes told Bloomberg Law. 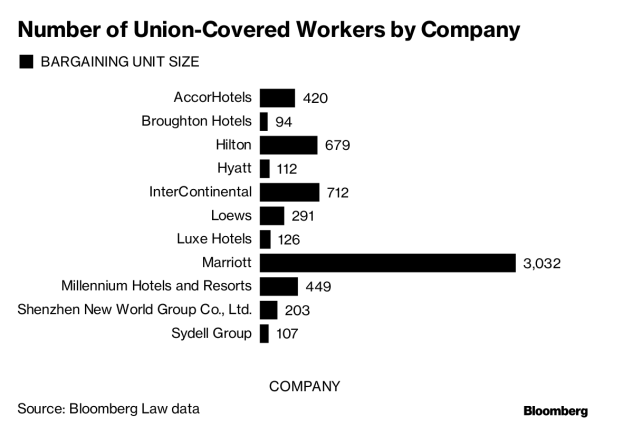 If employees vote to strike, at least 6,225 workers across LA-area hotels could be on picket lines in the area, including more than 3,000 Marriott employees, according to Bloomberg Law data. And the LA workers are setting their sights high. Sulkes said the union is demanding a $25 minimum wage for the unionized hotels. To reach that threshold would be “really astonishing and powerful,” she said. Many of the hotels with contracts ending Nov. 30 are Marriotts, but the hotel chain is not worried about strike action, a spokesman told Bloomberg Law. “To put the situation in perspective for you, Marriott International has about 70 managed and franchised hotels in Los Angeles,” Marriott spokesman Jeff Flaherty said in an email. Only a small fraction of those hotels are now without a contract. Negotiations are taken seriously, Flaherty said, with contracts always reached in the end. “We have no reason to believe that this negotiation process will be any different,” he said. Hilton and InterContinental did not respond to a request for a comment. Negotiating a common expiration date with many brands has been an intelligent strategy for the union, giving them more leverage when it comes time to negotiate a new deal, Cornell School of Business professor Bruce Tracey told Bloomberg Law. “That puts a lot of leverage in their court,” he said. The strategy has been employed for the last five to 10 years, Tracey said. UNITE HERE’s Sulkes compared the LA negotiations to UNITE HERE’s Chicago strikes in early September. Both involve many different hotel brands around a single urban area. The two cities differ in concentration of the downtown area, but that could be an advantage to the union in Southern California. “This is exciting because it’s sort of all over the place,” Sulkes said. The hotels are in cities outside Los Angeles downtown proper, including Glendale, Santa Monica, Manhattan Beach, and Universal City. “I think it has the potential to open even more conversation with even more people,” Sulkes said. Union presence in more neighborhoods, towns, and cities provides more opportunity. Cornell professor Tracey disagreed, saying that an urban area’s features don’t impact a strike. “I haven’t seen any direct evidence that those geographic features matter a heck of a lot,” he said. UNITE HERE has pushed for higher wages across the nation in the last year, but each city has its different individual asks. In LA, cost of living shuts out many employees from living near work, Sulkes said. Tracey said a tight labor market squeezes employers and raises fixed costs. “If you back up to a strategic level, the scarcity of talent is pretty universal,” he said. Employers either need to pay up for higher costs, or look to cut costs elsewhere. Separate brands also will respond differently to market demands, he said. “There’s philosophical differences between how Marriott operates and how Hilton operates,” which can play out in wages, he said. About 2,500 unionized Marriott employees in San Francisco have been on strike since Oct. 4. Employees have gone back to work in seven other regions after reaching a deal with Marriott. Other areas that saw strikes this year included Boston; Detroit, San Jose, Calif.; Oakland; Seattle; Maui; and Oahu. Workers in the Bay City currently make about $22 an hour, San Francisco local union President Anand Singh previously told Bloomberg Law. Negotiations in San Francisco are planned for Saturday and Sunday, Gumpert said.